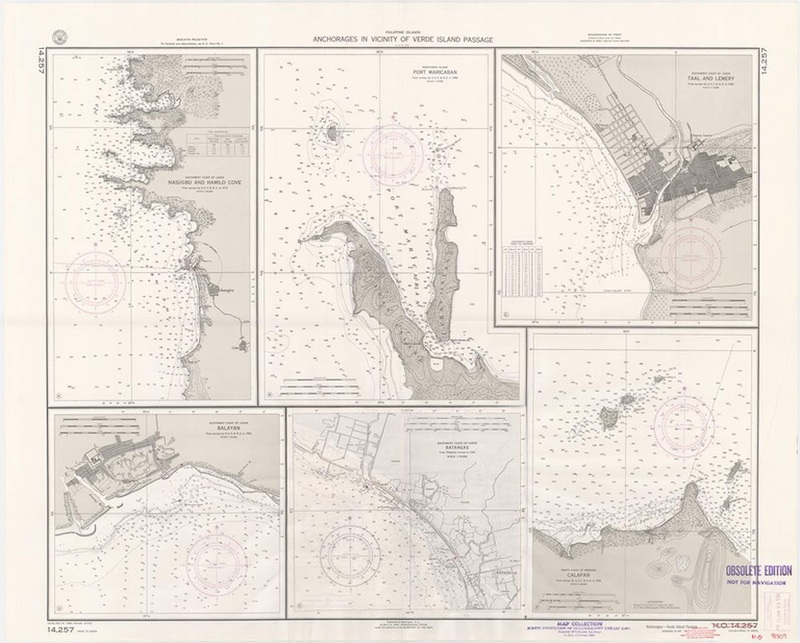 Map of anchorages near the Verde Island Passage from USC at San Diego Library Digital Collection. Above is a map of anchorages, i.e. areas where ships can anchor in, close to the Verde Island Passage. This passage is the strait or narrow body of water that separates the island of Mindoro from Luzon1. It has been downloaded from the University of California at San Diego Library Digital Collections. There, the map is titled Philippine Islands : anchorages in vicinity of Verde Island Passage. It was published on 13 February 1956 by the United States Hydrographic Office. This version on Batangas History has been enlarged from the digital version at USC San Diego for better viewing and may be enlarged simply by clicking on the map itself. Its enlarged dimensions are 2500 pixels by 2008 pixels. Its file size is 1.77MB.